With the relentless barrage of advertising for yogurt drinks with ‘beneficial bacteria’ ‘gut friendly bacteria’ or simply ‘good bacteria’ it’s likely that most of us understand the benefit of getting some probiotic bacteria in our diets. The problem is, many of these yogurt drinks are not the natural or most healthy way to do this and they are in fact just yogurt which has been artificially populated with some good bacteria and not at the kind of levels that are needed to be truly therapeutic. And, the yogurt is likely from unhealthy, grain fed animals but that is a whole other story! Fortunately, there is a better, easier and damn site cheaper way to get some gut friendly bacteria and that is through fermenting your own vegetables. 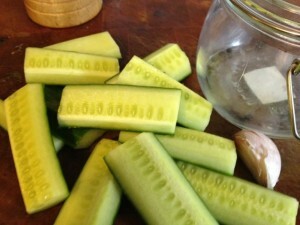 Pretty much any vegetable can be fermented, but the easiest and quickest are sauerkraut and pickles (pickled cucumbers). Cabbage for sauerkraut and cucumber both contain lactic bacteria so will ferment without any additional requirements other than some salt and water. Additionally, to ferment other vegetables, as long as you include some cabbage or cucumber, that will start the process off nicely. To keep it simple lets look at some pickles which are basically pickled cucumber. You could easily add carrots, cauliflower or experiment with other vegetables to see what works for you. You will need a jar to to ferment your vegetables in and ideally you want a jar that will allow air out but not in and these homemade fermentation jars are perfect. Alternatively, a standard preserving jar will do the job and the seal on these are designed to allow a little air to escape but not to let any in. 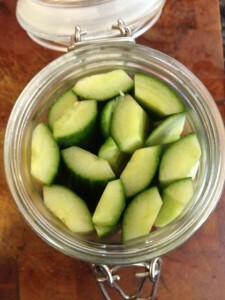 You then just seal the jar and let it sit at room temperature for around three to four days. When the water goes murky, they are ready. You may want to experiment with how long you leave them as it will adjust the taste but once they are fermented pop them in the fridge. I pre warn you, these are not going to taste like the pickles you are used to. They are pretty zingy and you may want to serve them with a bit of salt and balsalmic vinegar. They go well on the side of a steak or some other dish where you want something with a strong flavour (to replace crappy sugar laden sauce or some such). Anyhow, give them a go and let us know how you get on and if you enjoy them have a go at making your own home made fermentation jar. Please share this article with the links below and visit our Facebook page or Google plus page to stay in touch! Was wondering if you could add stevia, agave nectar or raw honey to the brine? You know, I am not sure, I can’t see it hurting but not sure if the taste may be a bit odd – have a go on a small scale and let us know! Hi I just came across your blog in search of healing. I have an autoimmune dis-ease and any herbs, vitamins etc cause me to get a fever and feel sick like I have the flu. I have an overactive immune system. I have gone to many doctors they just want to give drugs. I am curious about your wife having ms. I have researched so many eating plans and living with a husband that refuses to eat healthy and eats only junk makes it harder. I think I eat healthy and everyone that knows me thinks I am a health food nut….but in my heart something is not right nd the foods I am eating are not making me better. I can’t imagine just eating cultured vegies etc. Do you have any advice? I’m Jason & I run the blog along with Marcus, my girlfriend has similar problems to the ones you describe & it can be really difficult to find out which foods are causing the problems. Unfortunately many ‘healthy’ foods can also cause problems with some people, for example many fruits and veges contain FODMAPs which can cause severe symptoms. The best way to find which foods are causing your problems is to go on a strict elimination diet and then reintroduce foods one at a time. An excellent book which details how to do an elimination diet is this book. Typically foods that can be causing auto-immune problems (gut issues) are eliminated on the Paleo diet (grains, dairy, legumes), which I presume you are avoiding? Other typical problem foods (which are allowed on the Paleo diet) can be, eggs, nuts, seeds and nightshades (potatoes, aubergine, tomatoes). BTW home-made cultured / fermented veges taste amazing, much better than shop bought stuff which is pasteurised, thus killing all the helpful bacteria! Probiotics can also be bought in pill form if you really can’t stomach home made sauerkraut too. Stock made from animal bones is also a great food to help heal the gut as well, I’m planning a blog post about this so keep checking – I’m just waiting until I have enough bones to make another batch.